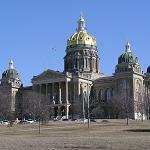 All Posts Tagged With: "Des Moines Tea Party"
Des Moines Tea Party: Huge Success! Today’s Tea Party was a great event and very successful!Â There were between 2,000 and 3,000 people there, great speakers, great weather.Â The crowd was very enthusiastic. The good news is that, if the other events across the country were like Des Moines, we are definitely beginning something that can make a difference. I appreciated the fact that the organizers were intent on ensuring the event was non-partisan.Â Even when Republican lawmakers came out to the event, they were asked to step aside… they were not allowed to be the center of attention. House Republicans offered another $52.9 million in cost-saving measures to the education budget bill brought up in the House today. To date, House Republicans have offered more than $200 million in cost-saving measures to budget bills.Â Of these, House Democrats have accepted less than $2 million. Below is a list of amendments, a brief description and the amount of savings that were offered by House Republicans to Senate File 470, the education budget bill.